We have two new additions to the Pot Hole Farm family. They are future mouse catchers and bug eaters. Right now they are a little small to do their job, but I can see there is a tremendous amount of courage and strength under their fuzzy little coats. The first addition is courtesy of Ronald and Vickie. He is a cute little gray and white striped tabby. The stripes on his forehead form a capital M so I named him Moby. He loves attention and for you to hold and stroke his soft kitten fur. He’s about ten weeks old now and still needs to grow into the loud motor that starts up the second he sees you. The second mouser is courtesy of John and Carol. I took in two barn cats from them before that were about a year old and they took off like they had been scalded as soon as I opened the cage. We never saw them again, but I believe one of them may reside at a farm about two miles down the road. So we thought a younger kitten may adjust to new surroundings a bit easier. She is coal black and is about four months old. I named her Minnie Pearl. I just picked her up today, so she needs to stay in the cage for a day or two. I imagine she will be ok to come out tomorrow. Right now she is not very happy and I was unable to snap a picture of her. Moby wants to be friends and although Minnie Pearl is very sweet, she doesn’t appreciate him jumping on top of her box and staring at her through the cage bars. She sticks her paw through the opening swiping at him and growling what I can only imagine is, “just wait till I get of here you little twit.” All in all I think Moby and Minnie Pearl will be great friends but most importantly they will help keep the mouse population down. By the way, to all my family and friends out there, the Inn is full as far as dogs and cats are concerned. No more homeless, pitiful, or needy pets. I don’t care how cute they are. John and Carol aren’t aware of it yet, but there is a rooster in my coop looking for a good home. I think he is kind of partial to them and would love to live on a donkey farm. All he asks for is a few girls to keep him company. Fair is fair. A rooster for three cats. 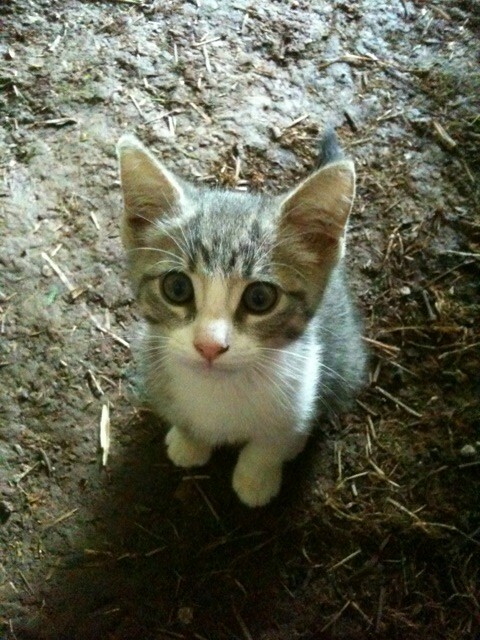 This entry was posted on Tuesday, August 31st, 2010 at 8:08 pm and is filed under Barn, Cats, Chickens. You can follow any responses to this entry through the RSS 2.0 feed. You can leave a response, or trackback from your own site. That “M” better stand for Mouser. Hey I gave fair warning about Shiner. You could have said no =) Moby is too cute. He has trouble written all over his face! Glad to see you have mousers now. A must must on the farm. Heck, I imagine for a cat there couldn’t be a better thing than having total freedom to stalk around and do as you wish while having the comfort of a caring family looking out for you too. I can only imagine how many cats you may have in the future :-). Were going to do our best to hold it at two cats. Not enough real-estate to employ more then that.